I had planned to make and post these cupcakes next month for Valentines Day or for my 1 year blog post, yep still can’t believe it is almost 1 year, but I was inspired to make them sooner! 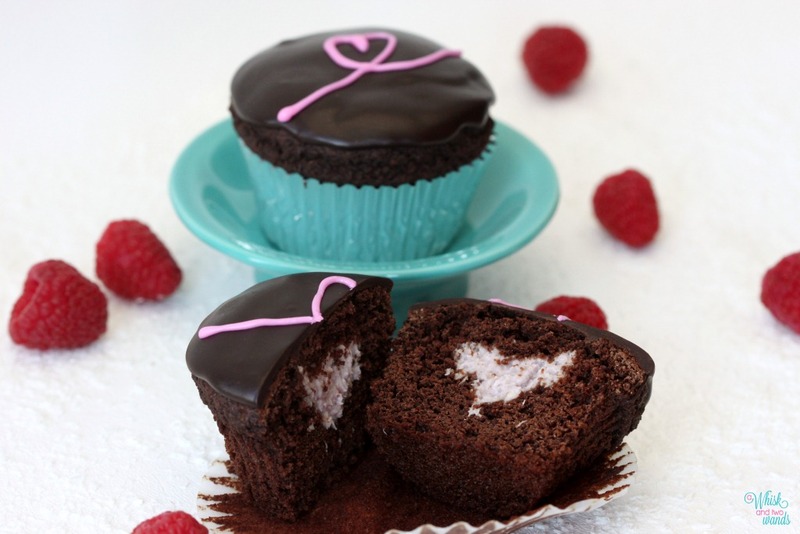 A childhood favorite, those little chocolate cupcakes with the cream filling and swirls on top. The ones that came in two packs that I always had to share with my brother. Yes I am talking about Hostess Cupcakes. I don’t understand it now is I can’t remember the last time I had one, well over 10 years ago, and the last time I did I remembered thinking it wasn’t nearly as good as I remembered it. They came to mind because I like making filled cupcakes but I am not a frosting person. I make cupcakes all the time, I always put lots of fluffy frosting on them because everyone else loves it and they look so pretty but it is the first thing to go when I eat mine. 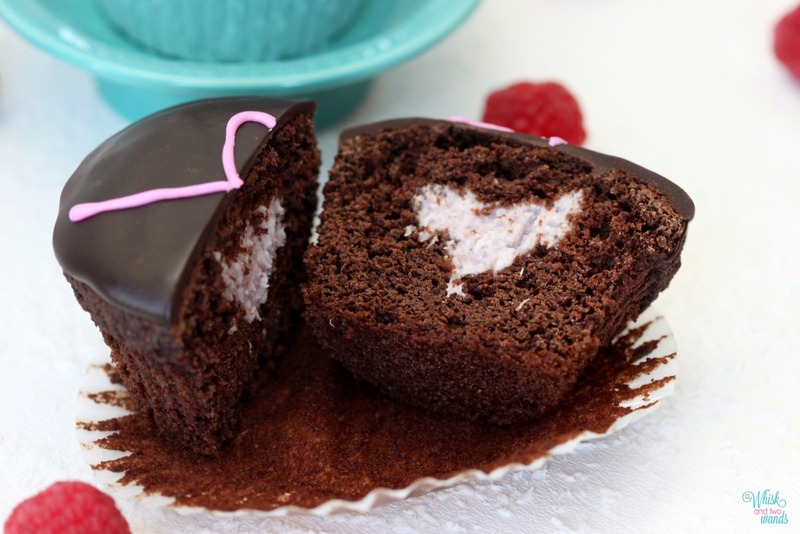 I do love chocolate and chocolate ganache topped desserts, like some of my raw cakes I have posted and I envisioned a cupcake with that on top and that is when Hostess came to mind. I wanted to make something pink and maybe aqua and all these ideas in my head. I made these from the heart, everything I love, for the ones I love. I really wanted to make the filling with fresh or fresh frozen raspberries, but it didn’t work out. I made multiple batches of filling trying to get what I wanted. Getting the cupcakes right to be like those snack cakes, balancing the filling and frosting so they weren’t overly sweat. My little helpers happy to taste each batch of cupcakes (testing out gluten-free and non gluten-free), filling, and frosting. The smiles on their faces when they were done are the reason I make everything. I hope you and the ones you make these for enjoy them as much as my family do. Note there is a little planning involved as you need to the coconut milk for the filling in the refrigerator the night before making these and the cupcakes will need to be stored in the refrigerator. 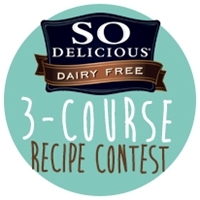 I entered these cupcakes in the So Delicious Go Dairy Free 3 Course Recipe Contest. *You will only use half of the filling to make a dozen cupcakes so feel free to cut recipe in half. I found it easier to make a full batch. Place So Delicious Culinary Coconut Milk box in the refrigerator overnight. Preheat oven to 350. In a medium bowl mix together the yogurt, milk, vanilla, coconut palm sugar, and applesauce. I do this so it can warm up a little before adding my coconut oil. In a large bowl mix together flour (plus xanthan gum if using gluten-free flour), corn starch (omit if using cake flour), baking powder, baking soda, sea salt, and cocoa powder. Add your coconut oil to the wet ingredients. Now add the wet ingredients into the dry and whisk until just combine. Divide into 12 lined muffin tins and bake for 20-24 minutes, until toothpick comes out clean. Let cupcakes cool completely. While cupcakes are cooling remove coconut milk from the refrigerator. I find it easiest to pull the sides out on the bottom and cutting across the seam to remove the milk from the box. Fold raspberry jam into the coconut milk and then fold the coconut into the mixture. Place the mixture back in the refrigerator until ready to fill the cupcakes. 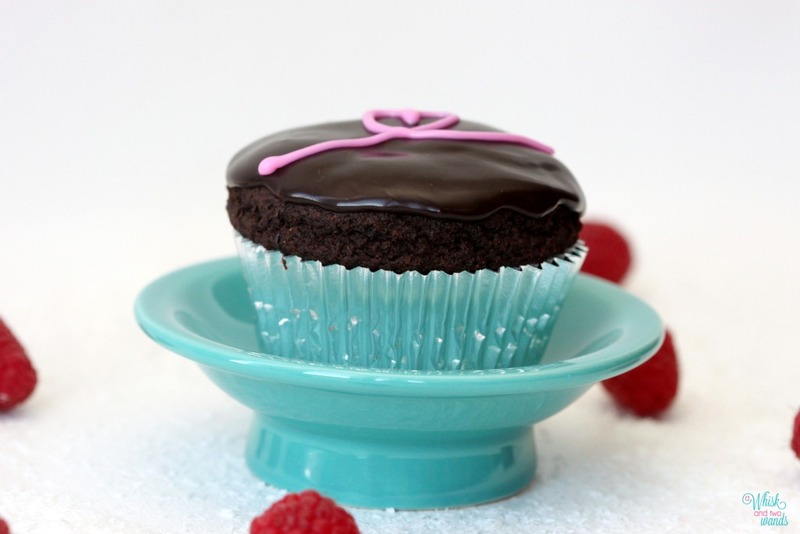 When the cupcakes have cooled cut a cone into the cupcake, hold the knife at an angle and cut a quarter size circle in the top of the cupcake. Save the plug from each cupcake as you will need it. Pipe filling into cupcakes using a piping bag or a plastic bag with the corner cut, fill almost to the top of the cupcake. Cut the top 1/3″ off the plug piece and place it over the filling to seal it in. Continue filling the remaining cupcakes. 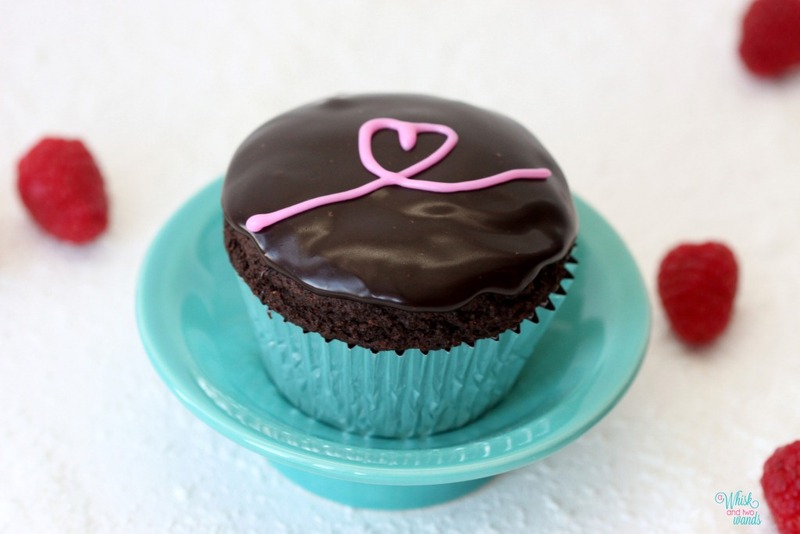 Place cupcakes in the refrigerator while making the chocolate ganache frosting. To make the chocolate ganache frosting mix together agave, coconut oil, vanilla cocoa, and sea salt until smooth. Remove the cupcakes from the refrigerator and frost the top of each cupcake. 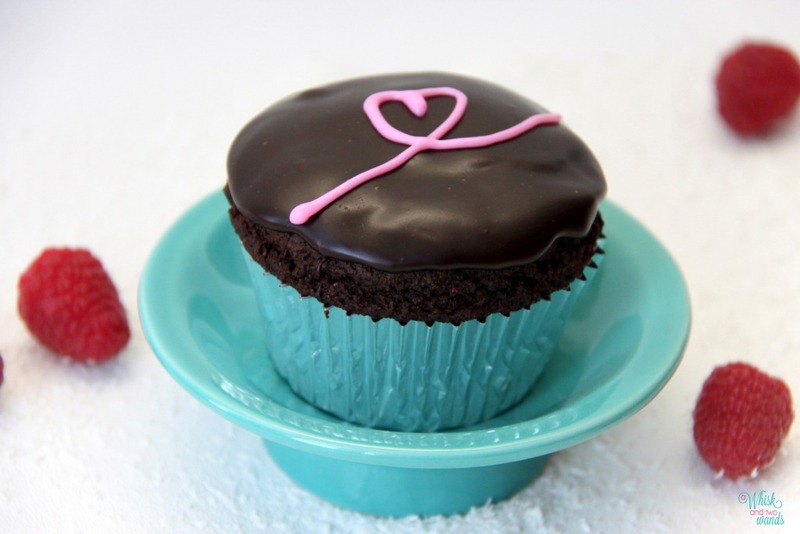 I find it works best by placing a spoonful, about 1 1/2 tbsp, of ganache in the center of the cupcake and frosting from the center out. Place cupcakes in the refrigerator while making the decorative icing or if not making the decorative icing place in the refrigerator for about 5-10 minutes to set or until ready to serve. To make the decorative icing whisk coconut creamer into powdered sugar until smooth, whisk in desired gel color and pipe decorative icing onto cupcakes. Store cupcakes in the refrigerator until ready to sever. Enjoy! Beautiful and very delicious looking! I am making these for sure! Thank you! I hope you enjoy them as much as my my family and I did!